An inside look at D.C. area innovators showing their stuff at South By Southwest. WASHINGTON — What do a philanthropic celebrity chef, former presidential speechwriter, burgeoning economic partnership and Air Jordan business partner have in common? They all brought D.C. flavor to the South By Southwest festival this week in Austin, Texas. WTOP caught up with presidential speechwriter Jon Favreau, superstar chef José Andrés, Michael Jordan’s business manager Estee Portnoy, and the Washington D.C. Economic Partnership, as all four unique contributors shared their experiences with the creative world. A former staffer on John Kerry’s 2004 presidential bid and later the speechwriter for President Obama for six years, Jon Favreau joined CNN pundit and former chief presidential campaign strategist David Axelrod for a live taping of “The Axe Files” podcast. For more than an hour, Favreau and Axelrod swapped stories and reminisced about their time together in Washington and the impact they both had on the 44th president’s administration. Favreau insisted that politics is much more of a marathon than a sprint. Does he have any hope for the future? “If there is any silver lining to this crisis, it’s the fact that we are in the process of creating an understanding among young people that we’re in this for the long haul,” Favreau said. Officially tagged as “Axe Files” episode No. 224, the podcast went live on Monday, March 12. Through his action-based non-profit World Central Kitchen, Andrés is dedicated to providing smart solutions to hunger and poverty throughout the world by building “smart kitchens” and training personnel in Central America and the Caribbean, South America and Africa. He is now legendary for his relief activity in Puerto Rico where, in the aftermath of Hurricane Maria, his efforts delivered more than 3.5 million meals to 70 different locations throughout the island. What should we do going forward? Headquartered in Washington, D.C., Estee Portnoy oversees the day-to-day business and marketing activities for NBA legend Michael Jordan. In this role, she has worked extensively with the longtime Chicago Bulls star, who finished his career as a Washington Wizard, for more than two decades, managing and growing the Jordan brand and public persona. At SXSW, Portnoy partnered with Asani Swann, vice president of business strategy for Carmelo Anthony’s Melo Enterprises, and Larry Miller, Nike’s Jordan brand president for a sports-focused panel entitled “Business Beyond the Ball.” Here, the speakers focused on their experiences along with the diverse opportunities available within the sports industry. Among Portnoy’s most relevant accomplishments was the role she played in positioning Jordan as the world’s first pure celebrity endorsement athlete. 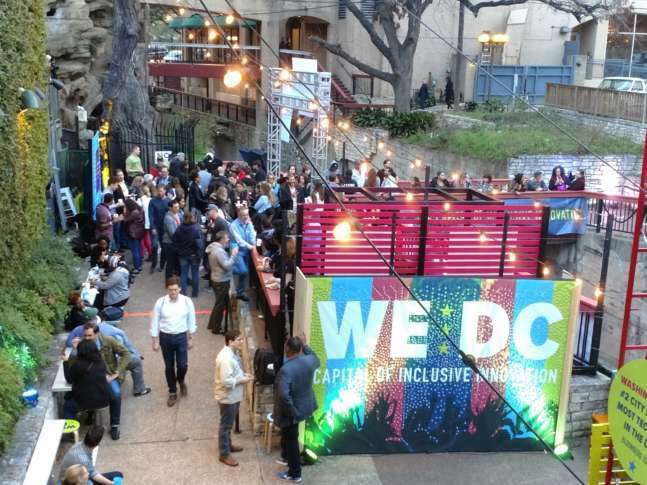 A six-year fixture in Austin designed to draw attention to Washington’s burgeoning start-up community, the Washington D.C. Economic Partnership once again hosted the WeDC House, which served as a showcase to all things innovation from our region. In addition to a dynamic party celebrating the best of DC-centric music, food and drink, the WeDC House presented two full days of diversity-focused programming, including sessions on female entrepreneurship, a “Black Girls Venture Pop Up and Pitch Competition,” the building of an LGBT inclusive workplace and a political playbook conversation led by Politico authors Anna Palmer and Jake Sherman.